Oct 01 04 Minibar will be taping a performance for the television program Music On Demand at Sixteen-Fifty (formerly known as Club Vinyl) in Hollywood on October 5th. You can print your Discount Tickets here, or you can get them from the band at O'Briens in Santa Monica this Saturday night. The show is scheduled to begin airing in November 2004; check your Local Listings to tune in. Thanks to your fan contributions, we added more Concert Photos from The Big Easy (Spokane) and The Showbox (Seattle) shows last June. And just in case you were starting to miss it, Tim recently sent in Various Photos from 2003. Sep 01 04 According to Variety, Minibar's most recent stint at the Troubadour "packed more of a kick than in the past." According to Upcoming Dates, prepare for another kick on Saturday night. Buy your tickets before they sell out! Jul 10 04 It's time for an outright percussive celebration! Happy Birthday to Malcolm Cross on the 22nd. Take the time to revel in Mal's Mini-Bio which has just been freshly updated. This week Simon's Mini-Bio also received a new batch of Petty details. And from the KPFA archives, catch this Youth Radio interview with Minibar's industry-wise frontman. The segment is about 9 minutes into the program, and you'll need RealPlayer to listen. Yee haw! 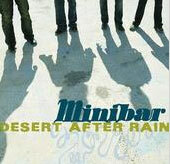 Even if you didn't make it to Austin last March, you can still watch Minibar demonstrate their Trampoline camaraderie with Pete Yorn and Minnie Driver in Blender's SXSW 2004 video footage. In live reviews, Virgin Mega determines that Minibar was "a perfect fit" for Keane's opening act at the Troubadour last month. "Their unassuming appeal, and straight-ahead rock had never sounded better." If you were as sad as we were that the Wallflowers "Back To The 'Bar" tour ended so quickly, the memories live on in Past Dates. Lucky for us, some of our favorite field reporters added their contributions to the Concert Photos gallery. Jun 10 04 Minibar has been infiltrating the airwaves with recent spins on L.A.'s Indie 103.1 and Bob Harris' BBC Radio 2 program. Triplearadio.com reports that the next single, "Unstoppable," will go for adds on June 28. Contact your local station to request more 'Bar! Eye Weekly's "Anti-Hitlist" calls Minibar a "rootsier version of The Wallflowers." Judge for yourself as Minibar heads "Back to California" with The Wallflowers. The two week tour brings the bands to a variety of intimate venues along the west coast. See Upcoming Dates to plan your summer road movie. May 07 04 In honor of Simon's birthday on the 16th we introduce....the MINIBARfans.com Video Gallery. It proudly delivers the "It Is What It Is" video courtesy of Peeled Zero Productions. Minibar's performance with Pete Yorn on the Ellen DeGeneres Show also inaugurates the video archives. If videos aren't enough of a feast for your hungry eyes, visit the Concert Gallery for images from Minibar's show with eastmountainsouth and visual documentation of the SXSW Trampoline Records party. A live review from Medleyville asserts that Minibar was the "real highlight of this party." Also in reviews, Perfect Pitch comments on the band's "spontaneous melodic intrigue." A princess, an ogre, and Minibar? The Shrek 2 soundtrack is released on Tuesday, but you can hear a clip of Pete Yorn and Minibar's rendition of "Ever Fallen in Love?" at the Shrek 2 Soundtrack site now. Next it's biker night in Alabama when PY and Minibar team up again for a City Stages Benefit on the 21st. Upcoming Dates has details of this show and more; don't forget to buy Simon a birthday drink while you're there! Mar 23 04 Bowl with the 'Bar: Exclusive video footage of Minibar's visit to RealNetworks is just a click away. Watch Minibar perform "Unstoppable" and "Breathe Easy" compliments of RealNetworks' "Down the Alley" series. While you're there, enjoy an interview, performances, and bowling antics with Minibar's fellow tramps. Also download a live, one-of-a-kind Morello track from our very own Malrello. For more visual stimulation, check out Concert Gallery additions fresh from the Old 97's tour. This week Fly Below the Radar sees its UK release on Excited Records. Order your copy from Pulse Records or a number of other UK retailers. Logo Magazine toasts the new release they call a "shimmering backdrop of heat-hazed desert highways." Hear what Temple University calls Minibar's "powerful punch." Also on the new release front, Gingersol marches to the beat of their own Minibar with the March debut of Eastern. Required listening for all minibarfans, Sid, Simon, and Mal's recording contributions are icing on the Eastern cake. Look for minisol/gingerbar reunions in a venue or asparagus field near you when tour schedules collide. In the meantime, don't miss the possible return of Tim's pedal steel when Minibar opens for eastmountainsouth this weekend. Upcoming Dates will get you there. The preceding update is dedicated to the memory of the Minibar apartment. Feb 26 04 The 2004 frenzy has begun. In Minibar terms, this means much motorway chuzzling and the live debut of amazing new songs. Most recently, Interstate 5 welcomed back the pub quiz champions while on tour with Waz. Now you can reminisce with Setlists and Concert Photos. Closing out the 2003 Gallery, check out additions from the 12 Bar homecoming gig, the Pete Yorn tour, and a chilly Halloween Trampoline Records show. Garnering well-deserved nods on several 2003 Top Ten lists (including those compiled by Rolling Stone and No Depression contributors), Fly Below the Radar continues to receive positive press. The Villanovan characterizes: "The voice of Simon Petty has the power and strength to put you in a pleasuring trance." Two Lazy Critics concur and vividly summarize the disc as "a warm desert breeze coming late in the afternoon." Soon Minibar's countrymen can head to their local shops to understand the hype firsthand. March 22 delivers a Minibar milestone with the UK release of Fly Below the Radar on Excited Records. Heed the advice of Christmas #1's Gary Jules who tells the BBC that "Unstoppable" is one of his favourite tracks. Next up the 'Bar joins the Old 97's for another rollicking west coast run. Following two final nights at the Troubador, Minibar veers south to conquer Austin in SXSW tramp style. Too much good stuff to keep track of? Upcoming Dates has got you covered. Last, but in absolutely no way least, remember that Sid accepts bushmills birthday gifts well after the January 13th occassion. Cheers!